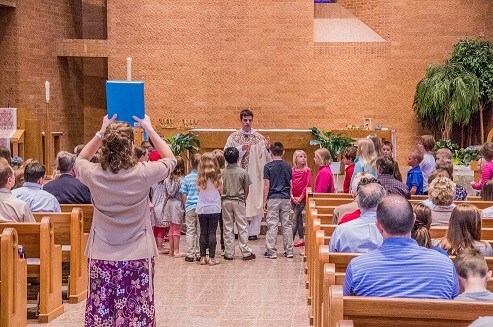 The Mass celebrant invites the children to the front of church for a blessing and dismissal right before the first reading. They follow the leader across the Gathering Space to the Chapel for their Liturgy of the Word, and return to their families at the time of the collection. Children's Liturgy of the Word is celebrated using an opening prayer, first reading, responsorial psalm or song, and Gospel reading from materials that have the readings of the day especially adapted for children. The homily is typically woven in throughout the time with introductions and follow-ups to each part. Leaders seek to engage the children through such things as questions and answers, additional stories and concrete examples, occasional visual aids, and hand motions with songs. It concludes with the creed (often adapted and in a format like the renewal of Baptism vows) and then some prayers of petition. When the group appears to be large, we welcome and encourage a few parents to come and assist with the children. In any case, parents are always welcome to accompany the younger children until their little ones feel comfortable with coming. CHILDREN’S LITURGY OF THE WORD is offered at the 5:00 PM Saturday and 9:00 & 11:00 AM Sunday Masses during the school year, except for holiday weekends. It is also offered during the summer at these Masses as often as we can staff them. This ministry is intended for children age 4 through grade 4 who are at Mass. There is no sign up. The children are invited forward at the time of the readings and are led to the Chapel. They return to their families at the time of the collection. • Several more leaders and assistants are needed as we expand this ministry. • Please contact Mike if you have any interest in helping (952) 469-6480 or mvievering@allsaintschurch.com.